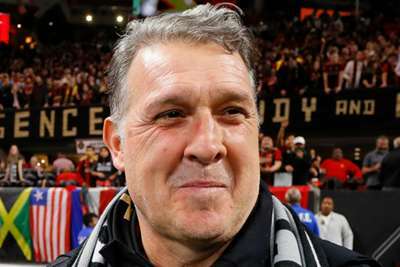 Outgoing Atlanta United coach Gerardo Martino hailed the success of the club's plan after clinching the MLS Cup just over two years after his arrival. Martino took over at Atlanta in the club's inaugural MLS season and announced in October that he would be leaving at the end of the 2018 campaign, citing personal reasons. A 2-0 victory over Portland Timbers saw his side crowned MLS Cup champions on an emotional night at Mercedes-Benz Stadium and he expressed his admiration for the way the club's directors have steered Atlanta to glory. "This club had a plan from the very beginning," he told reporters. "From the first time we spoke in September 2016 in Rosario. "The important thing is the club never modified anything from those plans and what makes the club very successful is that the directors have followed that plan to a tee." The 56-year-old's managerial career has featured numerous triumphs: he won the Paraguayan Primera Division three times with Libertad and once with Cerro Porteno before leading Barcelona to the Supercopa de Espana in 2013. His Barcelona side suffered defeat in the Copa del Rey final a year later and he has twice been a runner-up in the Copa America as head coach of Argentina. "It's been a while," admitted Martino when asked about the feeling of clinching a trophy. "I won a title with Barcelona in 2014, it has been a lot of disappointments but this one we won. "It's a special moment to culminate this amazing process that we've had in Atlanta. "I don't want to compare it to other clubs I've been at."